Our Dove Mountain Home Sales August 2018 video update provides a quick review of Single Family Residence (SFR) sales in this growing area. Dove Mountain, Arizona is a Master Planned Community. Dove Mountain has become a world-class resort community. Subdivisions are built on the rolling hills of the Tortolita Mountains. Dove Mountain, Arizona covers a vast 6,200 acres. Subdivisions offer homes for first time home buyers to the luxury homes at The Gallery, Canyon Pass and Ritz Carlton Residences. There is something for everyone in Dove Mountain Arizona. Dove Mountain provides residents an active outdoor living experience the year round. Play Kim’s Dove Mountain Home Sales August 2018 Video Update – NOW! For Tucson Real Estate Sales Updates for prior months, go to the Archives. For a look at the entire Tucson Real Estate Market – GO HERE! Development of the first Dove Mountain community started in 1996. Today there are now over 3,000 homes and 25 neighborhoods. New subdivisions include Los Saguaros, Del Webb at Dove Mountain, and Boulder Pass. Dove Mountain is expected to grow for many years into the future. Most subdivisions are low-density communities. 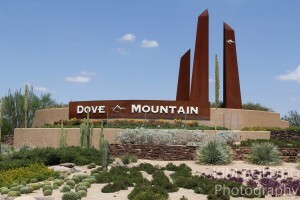 The Dove Mountain master plan restricts residential building to 20% of the land. 2010 saw the opening of the Ritz Carlton Resort in Tucson. The Ritz has put Dove Mountain on the map. The resort offers spacious rooms, spa and 27 holes of golf. The hotel restaurants and nearby Clayton’s provide a variety of dining options. With state trust and natural preserve land bordering Dove Mountain creates many recreational choices. Our Dove Mountain home sales report is one of the eight monthly updates on popular communities plus horse properties in greater Tucson, AZ. Furthermore, this update provides insight on the resale home activity in this rapidly growing area just north of Tucson AZ. Due to the broad range of home prices and abundance of new homes being built, Dove Mountain may be just what you are looking for. Finally, if Dove Mountain or another area of Tucson, AZ is on your list of future places to live, we can help! Why? We want you to know what to expect. And what to plan for. And our Dove Mountain Home Sales August 2018 report will get you on top of the Dove Mountain real estate market.